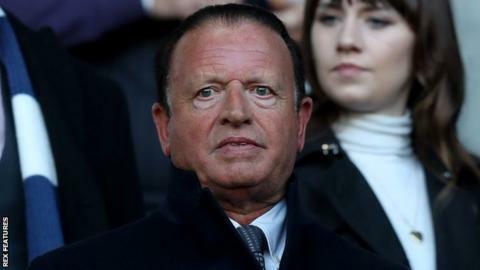 In January, Bolton owner Ken Anderson admitted that the club "needs someone with greater financial resources than I have"
Bolton Wanderers says an "agreement in principle" has been reached for owner Ken Anderson to sell the club. BBC Sport understands the consortium is led by businessman Parminder Basran, alongside businesswoman Sharon Brittan and entrepreneur Jeff Thomas. The Championship side are scheduled to appear in the High Court on 20 March after being issued with a winding-up petition by HM Revenue & Customs. "A period of due diligence has now begun," said a Bolton statement. "Once this process has been completed and the requirements of the EFL have been satisfied a further announcement will be made to supporters." Anderson owns 94.5% of club through his Inner Circle company and said in January that he was "doing his utmost" to find a buyer amid fan protests. Basran is the founder of investment firm VGC Partners and runs a private equity fund backed by Eduardo Savarin, one of the co-founders of Facebook. The club were placed under a registration embargo in January, meaning an agreed permanent deal for on-loan Forest Green striker Christian Doidge collapsed. The subsequent disagreement between the clubs led to Forest Green selling "No Ken Do" T-shirts - in reference to Anderson - with all profits going to the Championship club's Supporters' Trust. Anderson first bought a stake in the club during a takeover in 2016 along with former striker Dean Holdsworth, taking majority control the following year after acquiring Holdsworth's company's shares after it went into liquidation. Bolton were beaten 2-1 by Leeds United on Saturday which left them second-from-bottom of the Championship and four points from safety.